As you prepare for a new year at college, don't forget about the basic school supplies you'll need to ensure your success. Although college students spend most of their supply budget on textbooks, there are still some other basic items you will need to pick up before classes begin. Some students like to devote a notebook or folder to each class, while others prefer to keep everything together in one binder or five-subject notebook. Notebooks are great for keeping papers together without any stray sheets. If you will need to turn in hand-written assignments, make sure the pages tear out of your notebook cleanly or have some loose-leaf paper available for these occasions. Don't forget to also pick up some printer paper. Pens are usually best for taking notes in class, while pencils are useful for any subjects involving calculations, but in most cases it's a matter of personal preference. If you use pencils on a regular basis, don't forget to bring along a pencil sharpener or lead refills. Throughout high school, you were most likely forbidden from writing in your textbooks. However, in college, marking up books is a way of life. While some students underline important passages and make notes in pen, highlighters are a great way to accentuate important points and new vocabulary. Don't forget your fasteners. When it's time to turn in your term paper, you don't want to be hunting for a stapler. Check with your math or science professor for recommended models and required functions before making a purchase. Be warned - graphing calculators can be quite expensive. Even if you're a history major, you may want to keep a basic calculator around for everyday math like balancing your checkbook. All students would benefit from having a dictionary and thesaurus on hand. Other reference books will vary by major, from foreign language dictionaries to research manuals. It is possible to carry your books to class, but it's certainly not very convenient. It's also a good way to ruin your notes on a rainy day. 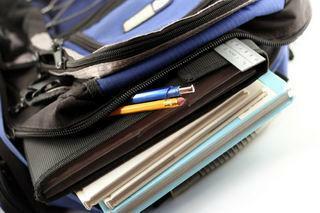 Some students prefer a standard backpack, while others like the style a messenger bag offers. If you purchase a high-quality bag, it should last you throughout your college career. While always a useful college resource, at many schools computers are now a requirement. However, if your school requires all students to have a computer, the cost of purchasing one should be factored in to your financial aid calculations. If you're unsure about buying a computer, you may want to try out the school computer labs first to get a feel for the quality of their equipment and availability. Computer supplies don't stop with just the basic laptop or desktop model, though. You'll also need a printer for printing assignments. You should also find out how you will connect to the Internet on campus and in your dorm to determine if you need an ethernet card or a wireless adapter. Consider purchasing a storage device like a flash drive for easy transfer and back-up of files, or if your computer comes with a CD burner, add blank disks to your shopping list. Finally, make sure you have all the required cords, cables, and power strips before heading off to school. It would be hard to miss the abundance of school supplies in stores as everyone gets ready for the big "back-to-school" rush. In late July and early August, retailers pull out their best deals on everything from glue sticks to laptops. If you're a bargain shopper, this is the time to stock up. If you do find yourself on campus without some studying necessity, the school bookstore also stocks the usual array of pens and Post-it notes. You may pay a premium for a folder stamped with your school mascot, though. The campus bookstore will probably be your best choice for special supplies required for specific classes like art materials or lab goggles. If you prefer to shop from home, most major office supply stores have an online presence, including Staples, Office Depot, and OfficeMax.